Join TelcoiQ and XO Communications for this exciting webinar. SIP has emerged as the preferred protocol for enabling mobility, unified and presence-based communications. 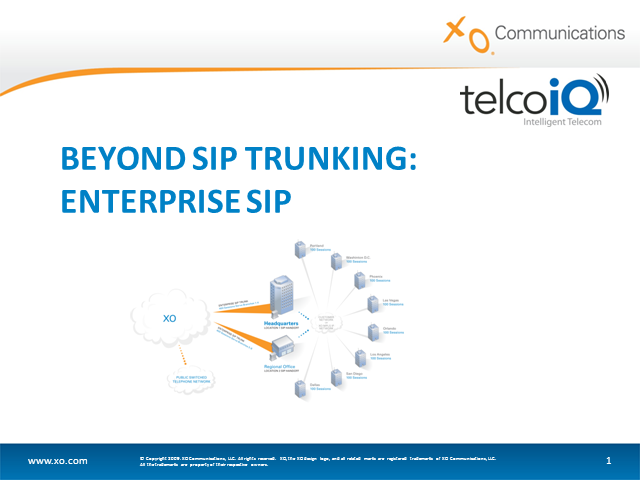 This webinar, educates both technical and non-technical audiences on the benefits of SIP Trunk service. Every business has unique IT requirements, regardless of company size or type of organization. When considering dedicated hosting & cloud solutions for some element of your IT infrastructure, it is critical that your hosting provider's solution aligns well with the needs of your business and applications.By mixing-and-matching compute platforms,We can help you create the optimal compute solution for your business. Enterprises need to spend more time building your business and less time maintaining your IT infrastructure, A well designed converged cloud Infrastructure delivers cost savings, high performance, scalability and security. Combined with a global data center footprint and leading network connectivity, there is simply no better approach to building a enterprise-class cloud solution. All attendees will receive two exciting white papers on IT Infrastructure in the Cloud. - What is Hosted VoIP?